Blowout Sale! 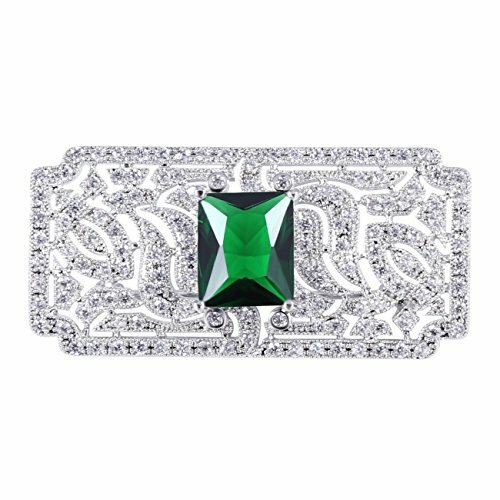 Save 61% on the GULICX Mother's Gift Vintage Style Art Deco Zircon Wedding Brooch Pin Green Silver Plated Base Bouquet by GULICX at SCRHI. MPN: AX08d. Hurry! Limited time offer. Offer valid only while supplies last. All stones are cubic zirconias. Cubic Zirconia is well known as a substitute for diamond, due to its high hardness and great fire. They are paved to the metal and you never have to worry about loosing stones. Well wrapped in an exquisite jewelry gift box. A great choice for giving as a gift. Normally,shipping in 1~2 business day,the transportation time is about 7-18 Business days. Manufacturer: Gelei Jewelry Co., Ltd. Publisher: Gelei Jewelry Co., Ltd. Studio: Gelei Jewelry Co., Ltd. If you have any questions about this product by GULICX, contact us by completing and submitting the form below. If you are looking for a specif part number, please include it with your message.